Alright Ok Getting Better Pretty Good Awesome If you're into serious woodworking machinery, you'll encounter equipment that was built with motors requiring 3 phase power. Now, if you're like most people, you don't have 3 phase power in your shop/garage/basement, you have single phase power in the form of a split phase 220 volt 3 wire system. The good news is - this situation often results in older 3 phase machines selling for lower prices. The better news is - you can run these machines on your house current with only a moderate amount of effort and expense. NOTE: Electricity demands respect - not fear. Be careful and you'll be fine. Be sloppy and, well, we like to attend Estate Sales - but not yours! 1 - Is it better to run motors on 110 or 220?? 2 - How can I tell if I have a 3 phase motor? 3 - What is 3 phase power and why do manufacturers like it? 4 - Why don't I just have 3 phase run into my house? 5 - So what do I do? 6 - Ok - I want to run the 3 phase motor. Now what? 7 - Can I build these or do I have to buy them? 8 - Where can I find specifics on building a converter? It really doesn't make any difference in theory. There is a difference in the power lost in the supply wiring though. . All things being equal, a 110 volt motor will lose 4 times more power through line loss than a 220v motor. This mainly means that a 220 volt motor will get to speed more quickly than it's 110v counterpart. Even this is irrelevant if the supply lines are less than 50 feet long. The cost of operation is the same. You buy watts not amps. Running a 110 motor at 10 amps is the same as 220 at 5 amps with regard to cost of operation. First stop is the motor ID plate. If it's missing, look at the input wiring - 4 wires in is a giveaway. 3 hots and a ground. Also - 3 phase motors don't have starting capacitors and they typically are small for their rated horsepower. 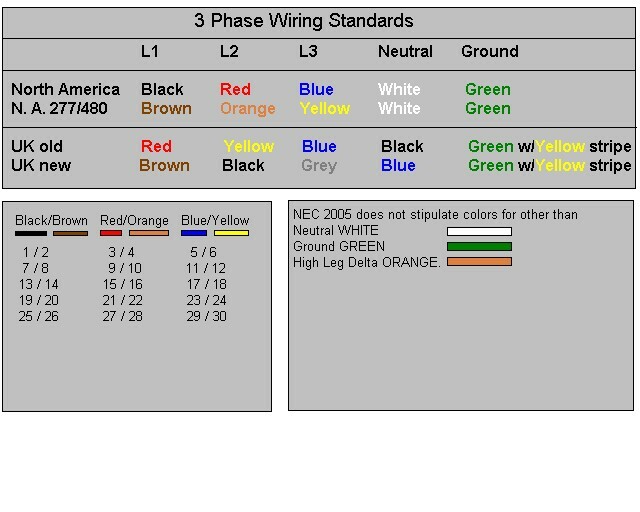 3 phase power has three "hot" wires, each 120 degrees out of phase with the others. In North America, the standard electrical frequency is 60Hz or 60 cycles per second. In Europe, 50Hz power is more common. 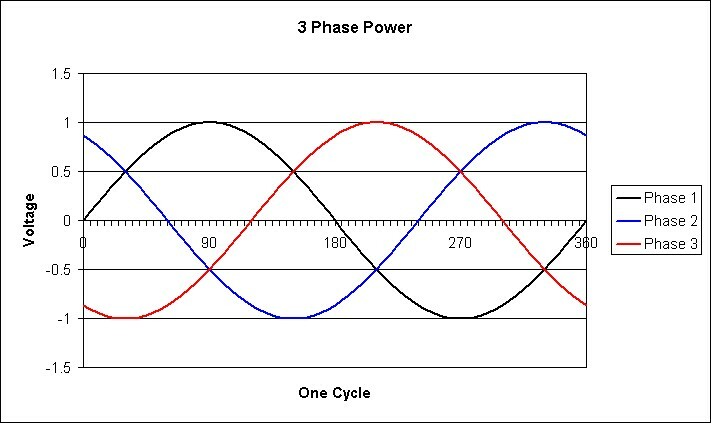 Shown below is a representation of 1 cycle showing the three phases. See the 3 Phase Power Resource Site for more information. The best simple description I've found is at Homedoctor.net. It goes like this: 110 / 220 volt single phase current is like a big strong guy driving a tent stake himself. At some point, the work is beyond what that one guy can do. 3 phase is like having 3 guys each striking the stake in rhythm. Each guy is not doing the work of the one big guy, but together, the three of them drive the stake in faster. The total amount of work being done is much greater when added up. Looking at the graphic you can see that one of the three phases is always nearing its peak, thereby generating more consistent power from the motor. 3 phase use allows typically smaller wiring, the motor may last longer and a lighter motor often will outperform a single phase motor using less energy. 3 phase motors also lend themselves to reverse and variable speed operation. You can check with your utility. It's possible that you could have this done. It's on the level of having a meteor land in your backyard - It could happen. If you're across the alley from a commercial user and there's 3 phase on the pole - like that. The cost for the service and the useage will probably still be prohibitive. You have 2 decisions to make. First - to replace the 3 phase motor with a single phase motor or keep the 3 phase motor. Second - If you are going to keep the 3 phase motor - how best to convert your house current to 3 phase. The decision to replace rests on your resources and the machine in question. Some machines have motors that would be nigh on impossible to replace with single phase. Some use commonly configured motors that are easily exchanged. Keeping the 3 phase motor and creating 3 phase power is perhaps the easiest and least expensive option. There are three ways to derive 3 phase for use in your shop. This method uses capacitors to start the motor which then runs on single phase power. A static converter does the job but you'll only obtain 70 to 80% of the motor's normal operating power. If you have a 5 hp 3 ph table saw - you probably won't notice the difference. Static converters must be balanced to the motor being run. You'll need a separate converter for each machine you run unless they're all the same horsepower (and even then you may find variances). This method adds another 3 phase motor - an idler - to the static converter providing current in all three phases and while not perfect will allow your motor to run at all or nearly all its rated power. A large rotary will let you run many different sizes of machines. Variable Frequency Drive: This is an electronic circuit - an inverter actually - that converts single phase AC to DC, and then to 3 phase AC. You'll need one that uses single phase input and provides 3 phase output. VFD's typically offer forward, reverse and motor speed control as well. These units are sweet but best for smaller motors. A VFD for a 7hp motor costs a fortune ($3,500 or more)! One for a 1.5hp motor is around $200-$250. VFD's are particularly good for a lathe or drillpress where speed control is important. Depends. How electrically savvy are you? Building a static or rotary converter is rather easy if you're comfortable with a volt meter and simple wiring circuits. If you can build one, the cost is very low. Surplus capacitors for a few bucks, a box to put it all in. A rotary adds the cost of the idler motor which is low or even free. If you don't know one end from the other - buy your converter! VFD's are something you buy. Start at Ebay. Mitsubishi is selling units directly on Ebay. Dealers Electric is also a good source for VFD's per several members here. If you want to buy a Static or Rotary converter - stalk the surplus shops and don't forget Ebay as well!